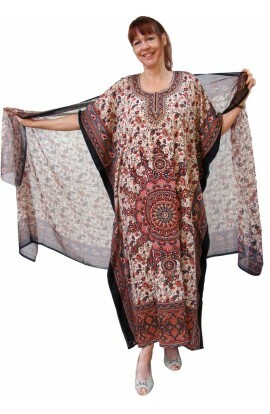 Long kaftans, full length, loose-fitting kaftans in cotton, polyester, viscose, silk, velour, tartan, fleece, towelling, all individually made in the UK. Comfortable to wear for relaxing in the home, on holiday, or for special occasions, kaftans from our standard range are free-sized and suitable for all UK sizes from 12 to 30. In addition to the standard free-sized range, our kaftans are available as Bespoke, made to measure items. Many of our customers return time and time again to buy kaftans that are made to their own specifications. If you require a kaftan that is larger, smaller, shorter, longer, a different shape, an alternative neckline, we are always pleased to be of assistance. Please do not hesitate to contact us for any details of this service.